While driving to a festival yesterday afternoon (which I will write about tomorrow), I came across this sign and forced my husband to pull over. 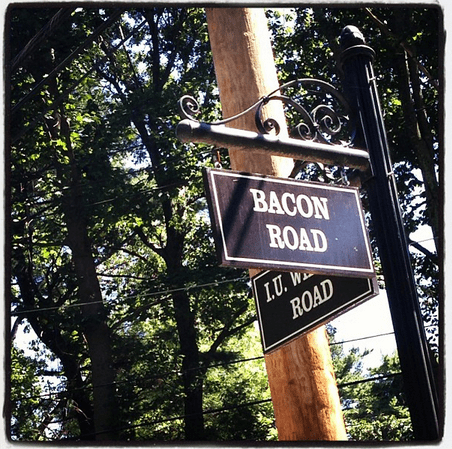 BACON ROAD. Are you kidding me? This was my life for 9 full months while pregnant with Caleb. I was borderline anemic and my bod was craving iron. It presented with an obsessive need to eat a grilled cheese with bacon on a roll DAILY. Oh man… now I want one right now. Anyway, Old Westbury is a ridiculously beautiful town. It’s about 3 miles from where I live right now. In fact, I posted this picture on my Instagram account yesterday and my friend told me that her husband ACTUALLY GREW UP ON BACON ROAD! What a small world! If you could live on any named street… what would yours be?! Previous Post: « Avoid Stressful Headaches This Back To School Season With Excedrin PLUS Enter To Win This Month’s Prize Pack HERE!